It was clearly against the law to celebrate and doing so one had to pay a fine for it. 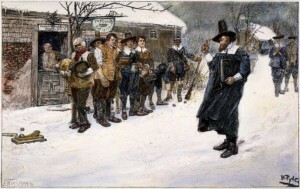 Being Puritans at the time, they believed the holiday was corrupt. A reverend, named Increase Mather, and father of Cotton Mather, Salem Witch Trials figurehead, said that the holiday was mostly full of drunkenness and card dealing. Apparently, in those times people weren’t doing cheerful acts. The holiday would cause acts of violence such as Wassailing, which meant to demand beverages and meals from the upper class in exchange of toasting their good health; refused and the happiness would end in wrath. 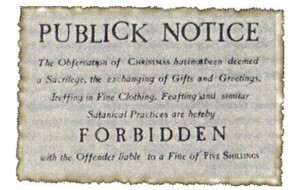 It would be after 22 years in 1681 that Christmas started making its way once again into the hearts of the Bostonians. Although the holiday was in adequate, in 1886, Royal Governor Sir Edmund Andros supported and attended Christmas events bringing an encouraging spirit to the people. Children were found to skip school, in 1869, on Christmas a year before it was officially made a national Holiday by Ulysses S. Grant.